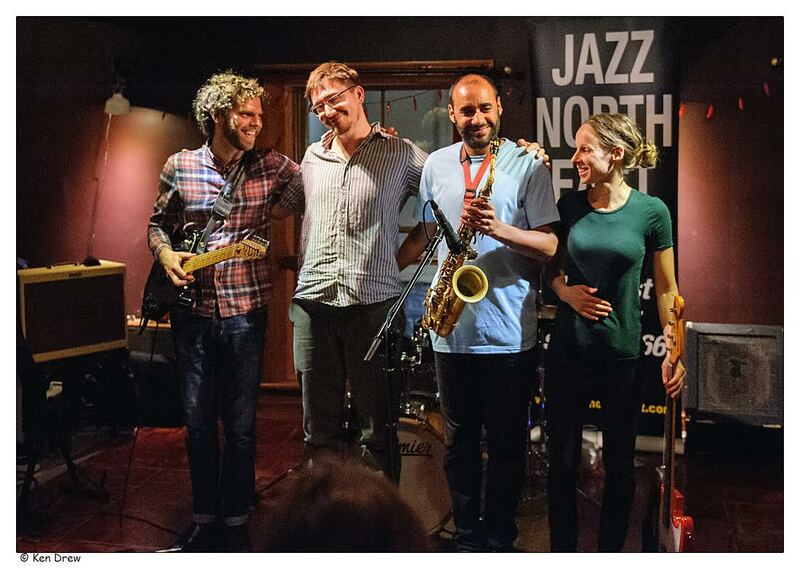 Chris Williams (alto sax); Moss Freed (guitar); Ruth Goller (bass); Finlay Panter (drums). (Review by Steve H/Photos courtesy of Ken Drew). Having returned recently from New Orleans, the jazz capital of the world, it was refreshing to see a contemporary modern jazz band playing in the jazz capital of the UK. Don’t get me wrong the music in New Orleans is magnificent with musicians playing on every corner 24/7. The main music sidewalk Frenchman Street has dozens of bars with live music all seeming to feature several bands a night. However, the music tends to be of the ‘tourist variety’- entertaining but nothing to write home about. 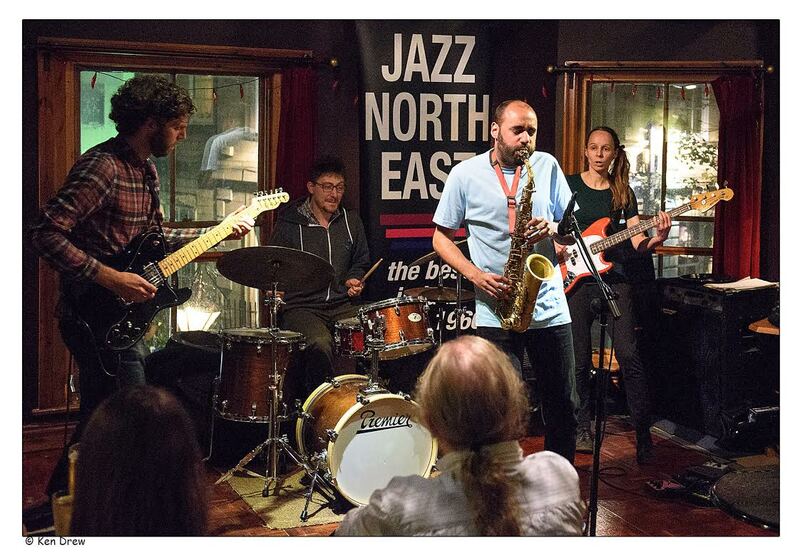 A good sized crowd gathered at the Jazz Cafe on Tuesday to listen to Let Spin for what proved to be a triumphant return to Tyneside having performed so successfully at their gig last year at The Bridge. All four band members have had successful careers with other bands:- Chris Williams is a founder member of Led Bib, Moss Freed has his own outfit Moss Project, Ruth Goller is a member of Acoustic Ladyland, and Finlay Panter hails from the Beats & Pieces Big Band. This band, though, appears to bear testament to the old adage of the sum being greater than its parts. All members share the writing credits, indeed each member has 2 compositions on their new album LET GO. The band seem to thoroughly revel in their collectivity with one another, with no single member hogging the limelight. Apart from Goller’s eclectic slightly minimalist piece All Animals are Beautiful, the tunes all seem to follow the same path. Starting off with a bit of drum and bass groove and just as one is getting comfortable they suddenly explode into a technicoloured whirlpool of exhilarating driving heavy rocking jazz which lifts the listener to a different stratosphere. It is hard and maybe a little unfair to single any one number out but the second set rendition of Up and at Em was truly outstanding with Finlay Panter on drums really giving it his all. At the end of the gig I’m sure I heard cheers of appreciation from the audience. All they need to do now maybe is add a couple of ballads to their repertoire to become the perfect band.